The upcoming State visit to Vietnam by the Emperor and Empress of Japan will be a memorable milestone in the close friendship and cooperation between the two countries, Prime Minister Nguyen Xuan Phuc has said. 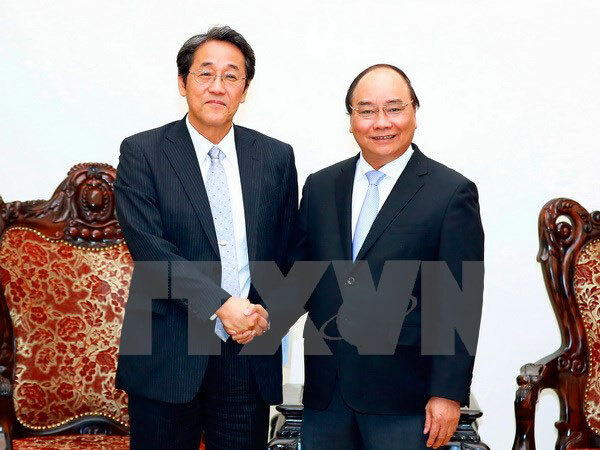 He received Japan’s Ambassador to Vietnam Kunio Umede in Hanoi on February 14 to discuss ways to boost the two countries’ cooperation. He said he was delighted with the visit to Vietnam in early 2017 by Prime Minister Abe and his spouse and appreciated the Ambassador and the Japanese Embassy in Vietnam for working closely with Vietnamese agencies to make it successful. Vietnam is working to prepare for the State visit by the Emperor and Empress, seeing it an important event, he said, asking the two countries’ functional agencies to do their best to prepare well for the visit. PM Phuc expressed his belief that with the forthcoming high-level visits, the cooperation and friendship between Vietnam and Japan will grow outstandingly, bringing practical outcomes and benefits for the two people. Ambassador Kunio Umede briefed his host that the Japanese Embassy is actively coordinating with relevant Vietnamese agencies in preparations for the upcoming visit by the Emperor and Empress. The visit will indicate that bilateral relationship is at the best-ever period and is increasingly being deepened in a more comprehensive manner, he said. He also informed the PM about the coordination with Vietnamese agencies in preparing a large-scale programme to promote investment in Vietnam with the participation of around 1,000 Japanese businesspeople. In the meantime, the Japan External Trade Organisation (JETRO) and the Ministry of Planning and Investment are working closely to ensure the success of the programme, he said./.